Sunlight is a combination of visible light and invisible light. The seven colors of the rainbow are visible lights, and infrared rays and ultraviolet rays are invisible lights. Infrared rays are one of the sun's rays. Infrared rays are the healthiest, penetrate into your skin deeply and they dissolve harmful substances accumulated in your body. The Infrared Rays vitalize your cells and metabolism. For years, the healthcare industry recommended infrared heat lamps as a source of far infrared heat but the lamps were cumbersome, extremely hot and difficult to maintain at a constant temperature. Today, many healthcare professionals use far infrared infrared heaters to treat a variety of diseases throughout the world. The efficacy of far infrared waves is very broad and the subject of recent study by NASA. Among the infrared waves, the far infrared rays, which have a wavelength of 8-14 microns, are especially good for the human body. These waves have the potential to penetrate 1.5 to 2 inches or more into the body allowing for deep heat and raising your core body temperature from deep inside. Our Sauna uses Far Infrared energy to penetrate the body's tissue. Tests have shown that the energy output is tuned so closely to the body's own radiant energy that our bodies absorb as much as 93% of the far infrared waves that reach our skin. By comparison, conventional saunas must rely only on indirect means of heat: first, on convection (air currents) and then, conduction (direct contact of hot air with the skin) to produce its heating effect. Our sauna is best used at temperatures between 100 to 125F versus 180 to 220F for traditional hot-air saunas. Yes! Infrared heat is all around us. The human body gives off and receives infrared heat and in the far infrared band. Other surfaces, like a warm street or heated vending cart give off infrared in the middle and near infrared band. Do you want to experience far infrared heat right now? Take you hands and put your palms together. Move your hands about 1/2 an inch apart. You will feel warmth eminating from your palms. This is far infrared heat very similar to the infrared heat emitted from our sauna's heaters. Radiant far infrared is all around us and is essential for human life. Far infrared saunas use low-EMF True Wave II Carbon/Ceramic heaters, which do not turn red hot, but instead produces invisible, far infrared heat. This is the same type of heat as produced by the sun and our bodies. Infrared heat is very safe and not at all like the heat produced by microwaves. In an infrared sauna, only 20 percent of the energy is used to heat the air, leaving the rest of the energy to heat the body. The radiant heat can penetrate deep below the skin producing a gentle warming inside the body. 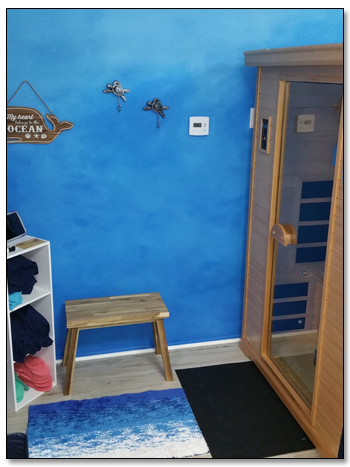 The temperature inside an infrared sauna is adjustable and averages a comfortable 100 °F to 140 °F This allows a person to sweat faster and to tolerate a longer period of time inside the sauna, allowing for the therapeutic effects to occur. Typical sessions last 20 to 45 minutes and can be repeated once or twice during the day to maximize the benefits. Infrared saunas leave you feeling invigorated, not depleted like conventional saunas. Detoxification - One of the biggest infrared sauna health benefits is its ability to increase your blood circulation and stimulate the sweat glands, releasing built-up toxins in the body. Daily sauna sweating can help detoxify your body as it rids itself of accumulated highly toxic metals (lead, mercury, nickel, and cadmium) as well as alcohol, nicotine, sulfuric acid, and other organic and inorganic compounds. Muscle pain relief - Increased blood circulation carries off metabolic waste products and delivers oxygen-rich blood to oxygen-depleted muscle, so they recover faster. Muscles relax best when tissues are warm, for greater flexibility and range of motion. Far Infrared heat relieves muscle tension and the deep heat of far infrared saunas help peripheral blood vessels dilate, bringing relief and healing to muscle and soft tissue injuries. Infrared heat also reduces soreness on nerve endings and muscle spasms as muscle joints and fibers are heated. Immune system boost - The deep heating from the Sauna infrared heaters will raise your core body temperature, inducing an artificial fever. How does this benefit the body? Fever is the body's natural mechanism to strengthen and accelerate the immune response, as seen in the case of infection. This enhanced immune system, combined with improved elimination of toxins and wastes via intense sweating, increases your overall health and resistance to disease. Weight loss and increased metabolism - According to the Journal of the American Medical Association, regular use of a sauna imparts a similar boost on the cardiovascular system to running. As you relax in the gentle infrared heat, your body is hard at work producing sweat, pumping blood and burning calories. As your body increases sweat production to cool itself, your heart works harder to pump blood at a greater rate to boost circulation. This increase in your metabolism will burn calories. Erase joint pain and stiffness - Time spent in an infrared sauna benefits client's suffering from many forms of arthritis. Radiant heat has also been effective in the treatment of sprains, neuralgia, bursitis, muscle spasms, joint stiffness and many other muscular-skeletal ailments. Much of the stiffness, aches and soreness that comes with aging is reduced or eliminated. Improves the appearance of cellulite - Cellulite refers to superficial pockets of trapped fat, which cause uneven dimpling or "orange peel" skin. It appears in 90% of post-adolescent women and is rarely seen in men. Common but not exclusive areas where cellulite is found are the buttocks, thighs, and the abdomen. Contrary to popular belief, cellulite is not related to obesity, and the appearance of cellulite is not always reduced by weight loss. Since the far infrared radiant heat of Sauna warms three times as deep as conventional saunas, it is significantly more effective at reducing cellulite. There is a direct link between the slowing of metabolic rates and the storage of toxins in fat cells. Sauna use and far infrared heat can increase heart rate and localized blood circulation, which essentially reverses the above-mentioned trends towards the accumulation of liquids in the fat cells to reduce the appearance of cellulite. Improves Skin - The profuse sweating achieved after just a few minutes in the Sauna carries off deeply embedded impurities and dead skin cells, leaving the skin glowing and immaculately clean. Increased circulation draws your skin's own natural nutrients to the surface. You'll see improved tone, elasticity, texture and fresh color. Increased blood circulation has also been shown to relieve acne, eczema, psoriasis, burns, lesions and cuts. In addition, open wounds heal more quickly, reducing scarring. Stress and Fatigue Reduction - Just a few minutes in the gentle warmth of an infrared sauna will help you feel relaxed, rejuvenated and renewed. Many client's comment on how much they look forward to their sauna session, as it's a great time to get away and release any built-up tension and stress. Infrared Saunas have also been shown to affect the autonomic nervous system putting you in the parasympathetic (rest and digest) state allowing your body to heal. Chromotherapy - Chromotherapy - or Color Light therapy is also offered in our sauna. Click here for a document about the benefits and history of chromotherapy. 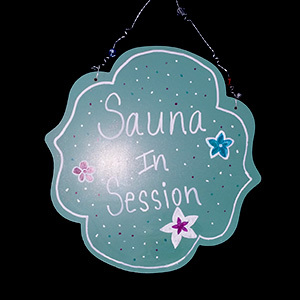 Our Sauna is also equipped with bluetooth so you can relax and listen to music during your 40 minute session and we also have Netflix available for you to watch. If you have any questions regarding your current medical conditions and the use of a Far Infrared Sauna please consult your medical doctor before use. Infrared saunas are contraindicated for the following conditions or you should consult your medical doctor prior to use. Infrared Saunas creating a cure for or treating any disease is neither implied nor should be inferred. In the rare event that you experience pain and/or discomfort while in the sauna immediately discontinue use.